Why did God give us music? Psalms 71:23 My lips will shout for joy when I sing praise to you– I whom you have delivered. 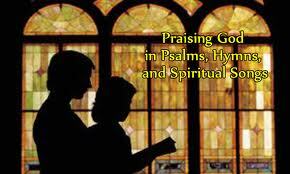 There are many scriptures about singing and music in the bible. I love music so much. Music is very powerful!!! Remember how people have reacted to music with Elvis, the Beatles, and Michael Jackson…etc. People went into frenzies because of their music. I have reacted in dramatic ways because of certain forms of music. Growing up I was moved by sounds coming from Motown’s artist and from show tunes, hymns and classical music. But there are two forms of music that brings me to massive tears sometimes….and that is gospel, Christian, and classical music. Sometimes just the music moves me and other times it’s the words combined with the music. There is one song however that just brings me to massive tears that can last for hours and it’s a song called None but the righteous by Bishop Paul S Morton Sr. http://www.youtube.com/watch?v=sV2DEjQIkyI This song may not affect you that way because everybody has their own personal sensitive spot in their heart and soul. But this song makes me think how blessed I am to be saved and the singer vamps…”I can’t wait to see His face and ask this question “don’t you want to see Him?” Sometimes I play this song before I pray and it makes me go into very deep intercession for souls. Sometimes I play it when I want to just worship the Lord and I cry and tell Him how I can’t wait to see Him. 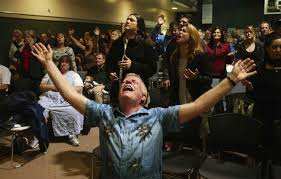 There are times in church that singing songs of praise will make the tears fall from my eyes. Sometimes when I sing I cry from a great connection and anointing with the music. Yes music is an incredible mystery that’s a gift from God. I’ve even heard music from the Lord in my prayer time. It has only happened once… but was so powerful that I never forget it. I can’t even describe it to you except to say it was…”powerful” and yet it’s probably something God allowed me to hear just for me because I was seeking Him so and it may not actually be heavens music. Why did God give us music and why is it important in our worship? Music can touch the soul in a way that is unique and mysterious. God created it and connected it to our senses and emotions. When we praise God through this form of worship…A unique connection is made between us and the creator and we bond through our heart, mind, soul and emotions. At that moment there is no one if front of God in our lives!!! All our focus is on Him and Him alone. And in return….He is connected to us as He inhabits our praise because we drew Him in with our adoration and worship. When I sing…for me it’s the same thing as my prayer times because I’m so connected to Him. Sometimes after I sing a solo in church…I’m so in my spiritual zone that I have to excuse myself and go next door to another room in my church just to… be still my heart. I could write pages on what music does to me and how we worship the Lord through it but I hope I’ve given you a little insight on music and God. Helps me focus on God. Heals my body and soul. Sends a clear message to God, Jesus and the Holy Spirit that I’m grateful everything they have, are doing and will do for me. Let’s God take notice of me because I calling His name. Let’s God know how exalted He is in my life. Music comes from your heart…you don’t even have to have a good singing voice….you can even be deaf. You can use sign language to sing. What really matters is… who your praise are directed at and the source of your praise which is your heart and soul. The Holy Spirit is the BEST music instructor and teacher. Ask Him to help you. If your church sings hymns…sing them from the depths of your heart and don’t just sing page 465 because you are instructed in the bulletin to do so. My best advice is to sing when you are alone with God!!!! Sing the song “Holy Holy Holy”. You can even let the Holy Spirit help you to make up words and music to a song…and you will be shocked at this incredible experience. Make up a song about telling God you love Him. You will be so blessed. This blog is getting really long so I better try to stop here! 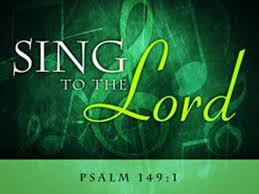 Sing…make music to the Lord all ye saint’s of God!!!! I really feel from the Lord that someone needs to hear this testimony. I sang this song for mothers day this year. To the person that needs this testimony and song, God hears all prayers and keeps all our tears. He knows JUST what’s best for us and answers us in His perfect time. As noted in todays message we may have to wait but while we are waiting He gives us grace…amazing grace. Trust Him today…hold on and wait. Help is coming! God bless you precious one.